Drifting, Suicide Rides, Spin Stunting, Super Cars, Stance Cars, Hot Rods, Classics, Rat Rods, Oval Track Cars, Circuit Cars, Precision Driving, StrongMan, RC Drifting, Automotive Cinema Experience, Drag Car Static Exhibition, Extreme Bike Stunts, Xtreme Kids Zone, FMX, LIVE Cooking Demos, Graffiti Exhibition, Go Karting, Drift Tikes, Premium Auto Houses Showcases … Wicked Dips Plastidip KZN SHOW ‘N SHINE – IASCA DYNO & SOUNDOFF and gaming simulators are incorporated into the event to give the event a holistic feel creating an environment of family fun and adventure to experience over the two days. Cash only, sunscreen, cameras, camp chairs, caps/hats … ladies please bring along flat shoes! need info how to enter vehicles into the drag event. 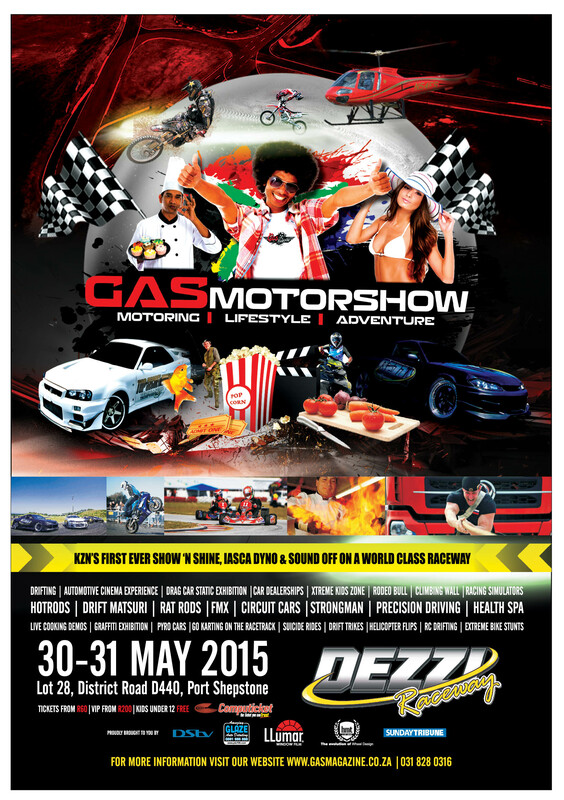 Please note there will be no drag event taking place at The Gas Motorshow on the 30-31 May 2015, However for all drag events taking place at Dezzi Raceway please contact dragracing@corner57.com for updates.